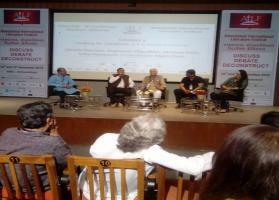 Ahmedabad, Nov 12-13: Ahmedabad International Literature Festival commenced with many leading personalities including poets, writers, storytellers, actors, directors, producers, journalists, publishers, editors, entrepreneurs and academicians convening at Ahmedabad Management Association (AMA) for the inaugural ceremony of the fest on Saturday. 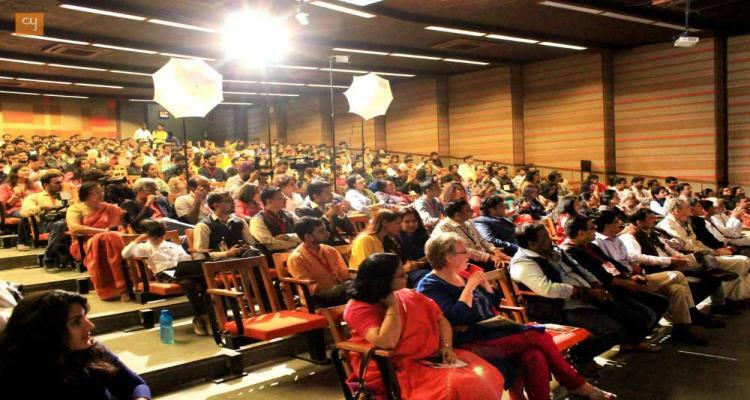 The LitFest seeks to promote writing, reading, speaking and listening, particularly among children and young adults, with a focus on literature, cinema, media and entrepreneurship providing a rich feast for self-development through value-based messages. 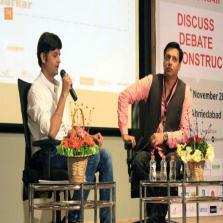 The event’s byline is ‘Discuss, Debate, Deconstruct’ with a positive note- ‘You can do it all. Be there.’ Over the course of two days, the fest explores varied themes like the relevance of Indian literature, world literature and Gujarati literature including mythology, poetry, short stories, literary commerce, entrepreneurship, workshops and much more. 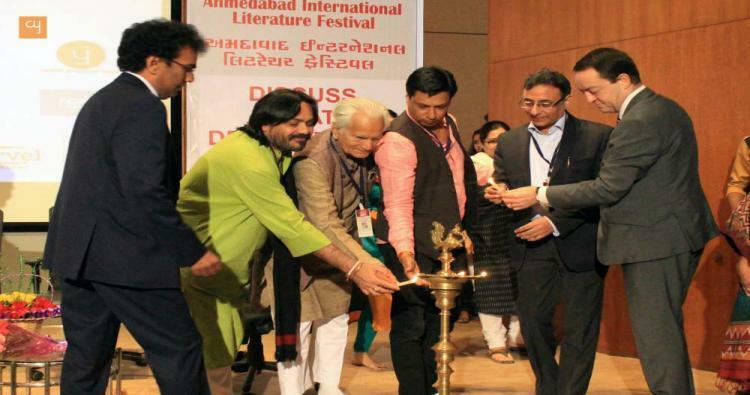 The first day of the festival was graced by Madhur Bhandarkar, Bollywood film director, Raghuveer Chaudhari, novelist and poet, Yogesh Gadh avi, chairman of Sangeet Natya Academy, Geoff Wain, British Deputy High Commissioner at Ahmedabad. The keynote speech was given by Sumant Batra who focused upon the power and significance of art and literature in adding to the soft power of a nation. 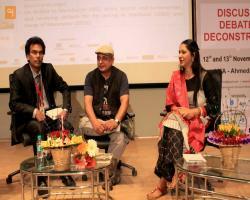 A total of nine sessions were conducted on the first day of the festival. 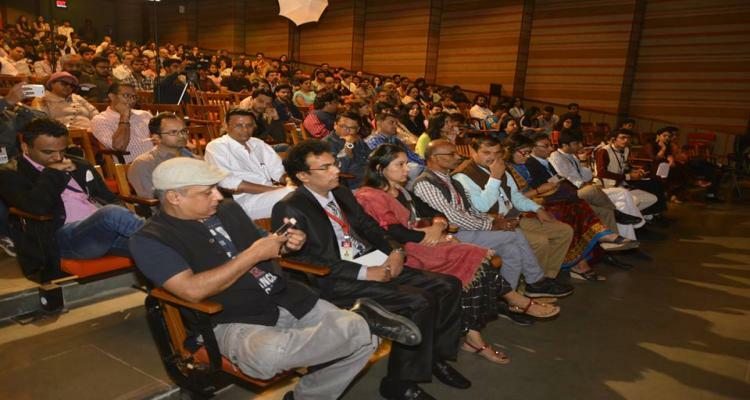 The fest got off to a super start, with an enthusiastic full house audience eager to listen to the conversation between National Award winning director Madhur Bhandarkar and popular Ahmedabad radio jocky Dhvanit. The theme of the session was ‘Captivating Storylines: How much does a good story matter?’ Mr Bhandarkar talked about how books and learning by watching quality work has added value to his creative journey. 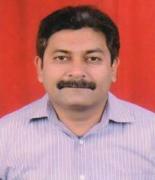 He mentioned that he was a school dropout, but despite that he never stopped reading books and newspapers. He got his education in the cinema while running a video library. The journey continued with the hard hitting second session of the festival, which discussed the controversial topic of ‘Media-driven Stories: How fiction drives the news narrative in present times.’ It was a panel discussion moderated by Pradeep Malik and had the participation of Ajay Umat, Brajesh Kumar Singh, Anurita Rathore, Kiran Manral and Tuhin Sinha. All the participants of this session have worked in the media for many years and had many insights on its functioning. When discussing the importance of journalism, one of the panelists mentioned that journalism is the first draft of history. And hence people in this field have to be careful. All in all the session generated a lot of interest among the audiences. The next remarkable session was ‘Looking for Literature: Is it in words around us?’ It was also a panel discussion moderated by Professor Nigam Dave and had the participation of distinguished personalities like Raghuveer Chaudhari, poet and novelist; Abnish Singh Chauhan, poet, critic and editor; Sandeep Nath, lyricist, screenwriter, director and producer; and Usha Narayanan, author and creative director. The session struck a chord with the youngsters at the event. During the discussion Raghuveer Chaudhary reflected, “Literature presents a vision of life through the sincere expressions of mind and soul. Therefore, it must reach to a larger audience.” Abnish Singh Chauhan spoke about the role of literature in order to culminate in ananda that leads a human being to a path of bliss. The other significant sessions, such as ‘Book Launch: Let’s Race, Daddy! by Soham Shukla’ (unveiling by Raghuveer Chaudhaeri); ‘Poetry is for Everyone: Why the gap between supply and demand?’ (Panelists- Kumud Verma, Nitin Soni, Santosh Bakaya, Tushar Shukla, moderated by Yaseen Anwar); ‘Revisiting Mythology and its Relevance Today: Reasons behind its growing popularity?’ (Panelists- Anuja Chandramauli, Suhail Mathur, Vinod Joshi, Usha Narayanan, Madhuri Sharma, moderated by Vishwesh Desai); ‘Book Launch: Shabdochchhav’; ‘Poetry Recitation by Pradeep Khandwala’; Gujrati Literature: Why it needs to reach out?’ (Panelists- Anil Chavda, Chinu Modi, Shobhit Desai, Sanket Joshi, moderated by Bhushan Mehta); ‘Short Stories: Are they around for the long haul?’ (Arun Kaul, Kiran Manral, Sumant Batra, moderated by Koral Das Gupta); ‘Gujarati Folk Tales: Continuing traditions’ (Panelists- Yogesh Gadhavi in conversation with Maulik Chauhan); ‘Book Launch: Ravi Manoram's Book unveiled by Piyush Mishra & ‘World Literature: Changing trends’ (Panelists- Arthur Duff, Fabrice Maingain, Tuhin Sinha, Vilpa Patel, moderated by Neeta Khurana), were also captivating and inspiring in tone and texture. 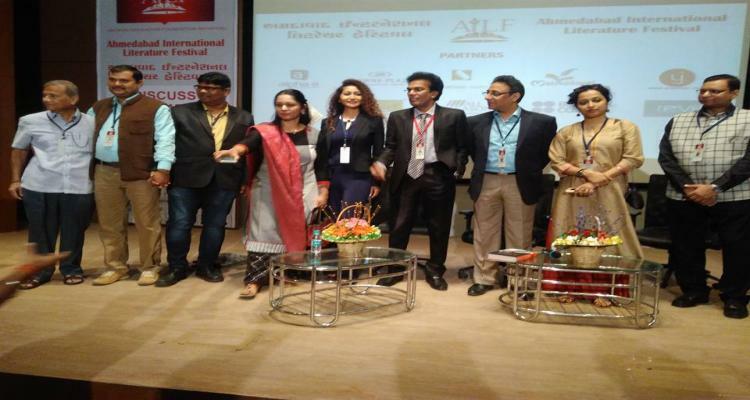 The second day of Ahmedabad International Literature Festival was as exciting and interesting as the first day and it started with a bang! Sunday Morning also received a houseful audience and the day rolled off with a panel discussion on ‘Literature and Cinema: Stories that lead to blockbusters.’ The illustrious panel consisted of Abhishek Jain, filmmaker; Sandeep Nath, lyricist, screenwriter, director and producer; Sumana Mukherjee, independent filmmaker and producer; Piyush Bhatt, teacher, author and director and it was moderated by Madhuri Sharma, Mrs India 2015. The conversation started with the question of the role of literature in cinema. 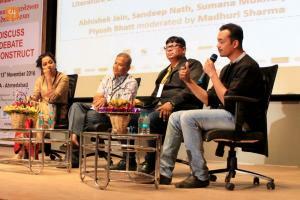 All the panelists said that literature is a very important part of cinema and in fact, cinema is derived from literature. As Mr. Bhatt said, “Movies are literature on screen and we shouldn’t differentiate between the two.” It was also pointed out that books have influenced movies since the day the movie industry was established. Mr. Nath elaborated on this by pointing out that cinema is an audio-visual form and needs content which comes from literature. 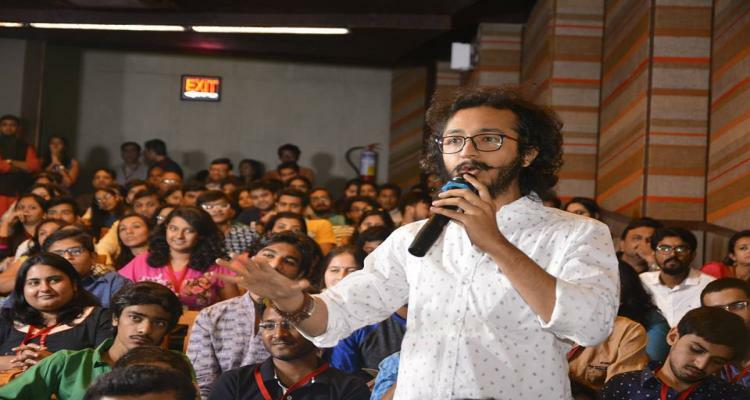 Mr. Jain had an interesting take as he brought out the fact that the process of film making starts with literature in the form of a ‘script’, which is then interpreted by the director. The moderator asked the panelists about their own works and their influences. Ms. Mukherjee’s next work is based on one of Tagore’s work and contrasts 1934 with the present. Mr Jain talked about his recent production ‘Wrong Side Raju’ and that it is influenced by media stories and the power of perception. 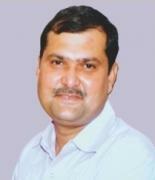 Mr. Nath’s next work is titled ‘DNA Mein Gandhi’ and looks at Mahatma Gandhi as a social reformer. The second session of the day had the multi-talented actor and lyricist Piyush Mishra in conversation with Anurita Rathore, senior journalist and Umashankar Yadav, the festival director on the theme ‘The Power of Words: Spinning magic.’ Mr Mishra was honest about the lures and attractions of the film industry and how easy it is to lose oneself in the glamour and the struggles of people who want to break into the film industry. It was very interesting to know that he is a spontaneous poet and the first poem that he wrote was while he was in class 8th. He feels that poetry can be written on any topic and one doesn’t need to search for it. He said that the only shortcut to writing was to write. He made a rather thought provoking point about the importance of creators ability to criticize himself/herself and the power of dissatisfaction (with one’s own work) in creating great work. He also enthralled the audience by reading out a couple of poems from the anthology of his poems- “Kuchh Ishq Kiya Kuchh Kaam Kiya” and also sang a rendition of the song 'Husna' very well. 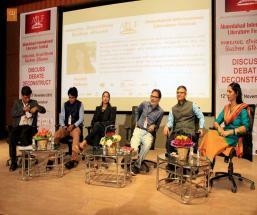 The other sessions of the day were- ‘Sheen in their Teen: Why must young writers be taken seriously?’ (Lalima Yadav, Sanjay Agrawal, Vishwesh Desai, moderated by Priya Vyas); ‘Literary Agents: Who all need them?’ (Anil Chavda, Arti Motiani, Chintan Sheth, Suhail Mathur, moderated by Yogi Trivedi); ‘Entrepreneurship and Creativity: Walking hand in hand’ (Asha Mandapa, Mehrab Irani, Ravi Manoram, Sumit Agrawal, moderated by Jigna Shah); ‘Pratilipi.com- Online is on Line: Impact of growing online readership on print content’ (Abnish Singh Chauhan, Falguni Vasavada, Manoj Jena, Sanket Joshi, moderated by Sahradayi Modi); ‘Social Entrepreneurship: Srijan Pal Singh in conversation with Jatin Kataria’; Romance in Books: A marriage made in heaven’ (Raksha Bharadia, Nitin Soni, Sudeep Nagarkar, Ravi Bedi, moderated by Lalima Yadav). 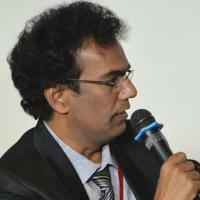 The speakers of the sessions were erudite and put their points before the audience well. They happily answered the questions raised by the audience and gave a great insight into the world of literature and allied fields in the country. 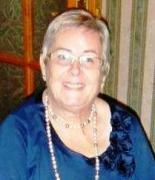 On the whole, all the sessions were very informative, enjoyable and benefiting to the lovers of language and literature. 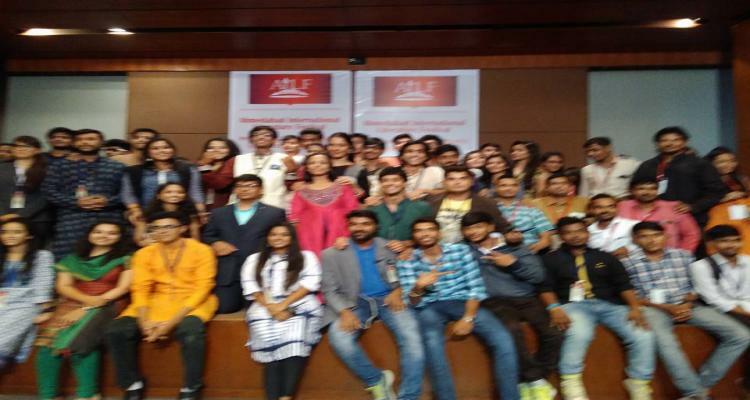 Along with lectures and discussions, the fest also played host to enriching workshops- ‘The Art of Letter Writing’ (Minu Jasdanwala), ‘Poetry Writing and Haiku Writing’ (Tulika & Vatsal Shah), ‘Paren Teens Workshop’ (Dr Nischal Bhatt), ‘How to Add 50000 Productive Hours to your Life’ (Sanjay Kr Agrawal), ‘Akha Nu Amdavad’ (Jay Makwana), ‘Tingle-E-Kavita’ (Fariburz Irani), ‘Shabdochchhav’ (Pinki Vyas), ‘Improve Poetry’ (Povera), ‘Open Canvass’ (Jharokha PDPU), ‘Writing for Blogs’ (Ranjani Sastry) among many others. The event was well organized and the highly active members of the organizing team, especially Rashmi Goyal, Pinki Vyas, Manish Patel, Fariburz Irani, Bhushan Mehta, Vikas Yadav, curator Anurita Rathore and energetic festival director Umashankar Yadav along with lovely anchors Nivid Desai, Simran Chhabra, Nitin Pillai, Nirja Vasavada, Kaveen Panchal, Ayeshah Jariwala, Raj Chundawat and Kankana Roy, should be complimented for their productive efforts.